Eight years ago, my ninth grade biology teacher thought she’d play a little prank on her unsuspecting students as a send-off to winter break. As we shifted restlessly in our chairs, straining our ears toward the bell, she reached behind her desk to pull out what she said was a seasonal treat to kick off the holidays. While less adventurous instructors handed out candy canes and sugar cookies, she offered us edible crickets. A few of my braver classmates accepted the insects, packaged in tiny cardboard containers like fun-sized boxes of raisins. As a vegetarian, I politely declined, though not as vehemently as another girl, who fainted. Yet my swooning classmate had probably swallowed many unfortunate insects in her lifetime without noticing — small (and sometimes, not so small) amounts of bug fragments often end up in food products to no ill effect. Although most Americans would turn their nose up at the prospect of dining on bugs, they are actually in the minority. 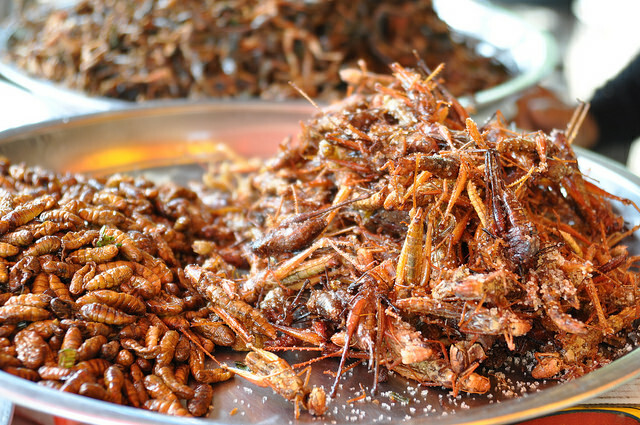 People across the world eat insects: street vendors in China commonly sell deep-fried cicadas and traditional Thai recipes frequently call for giant water bugs, which apparently taste like shrimp. Here in the United States, Americans happily feast on lobster, an aquatic relative of insects and spiders. No, this aversion to entomophagy, or eating insects, isn’t an innate revulsion buried deep within the human condition. It’s an artifice of Western culture — and it needs to change. About 90 million beef and dairy cows live in the United States. That’s more than 10 times the human population of New York City. Raising all that livestock, both here and in the rest of the world, is devastating the environment. Over a quarter of all land on the planet not covered in ice is used for grazing, according to a 2012 report by the Food and Agriculture Organization of the United Nations. This has led to rampant deforestation — in the 40 years between 1963 and 2003, 40 percent of South American forests were torn down, two-thirds of which has been replaced by pastures. Not only does this disrupt forest ecosystems, but it speeds global warming; the FAO estimates that the meat production industry contributes almost 15 percent of all man-made greenhouse gas emissions. Entomophagy offers a greener alternative. Insects provide high levels of protein, fat, calcium and iron, as shown in a 2014 study of edible insects. In fact, the nutrition content of many insect species rivals that of beef, fish and chicken, according to the study, which also notes that raising insects requires less space and resources than common livestock. No wonder many environmentalists advocate substituting beef and other meat products with crickets, mealworms and beetles. To be sure, there are hurdles to switching to insects. In a 2015 study published in the journal PLOS ONE, researchers found that while insects fed a high-quality diet of grains yielded high levels of protein, those fed a lower-quality, grass-based diet often died before they grew large enough to eat. As a result, the study authors argue, raising insects for food requires roughly the same energy and resources as raising poultry. Cheered by these results, carnivores and writers jumped at the chance to proclaim that once again, insect-eating should remain confined as a disgusting yet entertaining challenge in reality television shows. What those critics overlooked, though, is that insects still compare very favorably to beef, which has a much bigger environmental impact than chicken. It’s also important to consider the broader picture: Insects may be the perfect gateway for Americans and the Western world to start making serious changes to the way we eat. We need to look beyond the narrow issue of protein content per unit and the rather subjective appeal of a chocolate-covered cricket. Instead, we need to fundamentally change our relationship with food. Insects do not just offer a convenient meal but also a means to explore entirely new ways of eating, because our old methods are laughably unsustainable. We need to let go of our long-standing dietary habits, and perhaps crickets are a good way to start. If we could manage to incorporate insects into the American diet, opting for crickets over candy canes, then there may be hope for us yet. I agree that the West needs to fundamentally change its relationship with food, but the best way to do this is to go vegan, which is better for the environment, human health, and the animals. Thank you Shira for your interest and writing such a thoughtful piece on the tremendous benefits of insects as food and feed. As a premier farmer of insects for human food, receiving USDA, Canadian and European Organic certification, among other triumphs, we still seek to look at science and empirical evidence to drive our business and construct. We can assure you for example that our feed efficiency ratios are far better than the published study you reference. The study has many flaws and certainly doesn’t match with our outcomes, soon to be published. Appreciate the opportunity to reflect. I’m thrilled about the advent of microfauna! Much too much of global resources go into raising, rendering, packaging and transporting ‘Western-acceptable’ meats. And taste? I find cricket flour slightly nutty, but not distinct enough to compete with other ingredients in cookies, etc. Exo’s cricket bars, for example, are delicious – especially the Apple-Cinnamon. And thank you, Jarrod! I recall from at least 20 years ago that chitin was promoted as a diet aid that was processed into capsular form from shellfish. The marketing at that time hinted at a ‘magic ingredient from the sea’ and it’s still for sale on Amazon. Let’s remember from 9th grade Biology class that shellfish and insects are all arthropods with chitinous exoskeltons. Lobster? Crickets? YUM! !